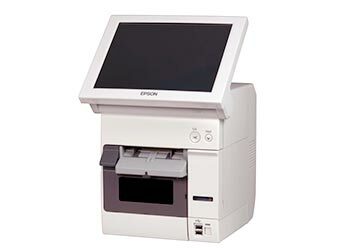 Epson TM-C3400-LT Standalone Label Terminal - Print colour labels, tickets and wristbands on need with the Epson TM-C3400-LT - a standalone label printing terminal. The TM-C3400-LT includes an integrated control panel plus a dirt and moisture-resistant touch-screen, and is housed in a dust-proof case that's comparable to IP5X. Its little footprint and all-in-one, plug-and-play concept make the TM-C3400-LT suitable for users with restricted area. The TM-C3400-LT's colour printing abilities enhance recognition, assisting avoid vital mistakes in a variety of applications, such as wristbands and prescribed labels for health care. Printing custom-made designs completely colour and on need decreases expenses connected with pre-printing, consisting of stock management and label waste. 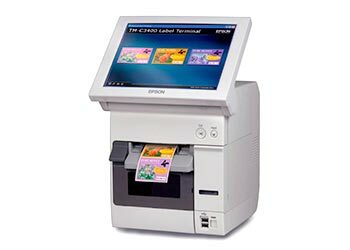 This extremely flexible label printing terminal works with a large range of products. Whatever the media utilized, Epson's DURABrite Ultra pigment ink offers long lasting prints that withstand smudging, fading, water and most other liquids, and can endure requiring storage conditions. Another advantage of inkjet innovation is enhanced security, as thermal transfer bows can bring imprints of delicate info Epson TM-C3400-LT Standalone Label Terminal. For reputable outcomes, Epson's trademarked automatic nozzle inspecting innovation (AID) repairs and senses printer nozzle obstructions or dead pixels in barcodes. The TM-C3400-LT is developed to be simple to utilize, with all functions at the front, consisting of consumables replacement. Its TFT touch-screen supplies instinctive control, and can be slanted as much as 90 ° for an optimised seeing angle. The pre-installed Windows ® os, printer drivers and software application energies allow uncomplicated printing, supported by the optional start-up label software application. Suitable for users with restricted area thanks to its little footprint (300 x 213 x 345mm W x D x H). Print labels that withstand smudging, fading, water and most other liquids thanks to Epson's DURABrite Ultra pigment ink. TFT touch-- screen supplies instinctive control, and can be slanted approximately 90 ° for an optimised seeing angle. No PC required: Touch-screen & control panel. Rugged develop: Splash-resistant, dust-proof case. Little footprint: Compact, all-in-one design. Versatile: Prints labels, wristbands & tickets. Resilient prints: Ink withstands water, smudging, fading.